"Not so long after Sue arrived at All Saints, as she was getting to know us all, we were asked to fill in a form and say if there were any existing areas or future plans that we felt we would like to get involved with or maybe felt we had some gift/talent/skill that we could offer. After considerable deliberation, procrastination and hesitation, I offered my services to a café idea, thinking I was on to a safe bet, after all, the Webber Hall had no running water, let alone a toilet or a sink – perfect. How wrong could I be?! Now here we are, 18 months later, on the brink of a somewhat daunting but hugely exciting venture and I am having to eat my words. 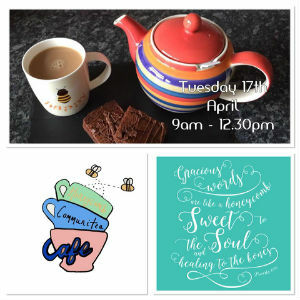 I truly believe the chance to offer our community a place to come and relax with a cuppa is a wonderful opportunity to further walk in Love and Obedience and what better way to do it, than with cake! And most importantly, place God in the mix, blending together everything we do. The last thing we had to come up with was a name for our café and this actually proved quite a difficult task. Finding something catchy and appropriate was really difficult and in fact, despite mulling over lots of ideas, neither Sue nor I really felt happy or confident with any of our suggestions and we were really at rather a loss. It wasn’t until we were on the way back from our Ikea trip, chatting about it, waiting at traffic lights, when I said to Sue, there has got to be a verse in the Bible to help us that suddenly inspiration came our way in the form of a verse Sue found from Proverbs. 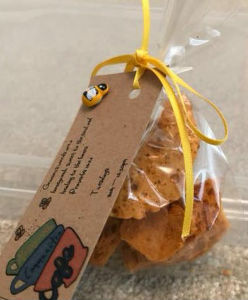 "calm, courteous, kind, compassionate, tender- hearted, sympathetic, pleasant and polite", indeed all the qualities that we hope that we can share with our community when they come to the café and our gracious words are a honeycomb so what better name could we have, than ‘The Honeycomb Community Café’, hoping and trusting that we will provide a comfort and blessing to all we welcome through the door. So, we open on Tuesday the 17th April, from 9-12.30. Please support us in this brand new venture. We would definitely value your prayers and, of course, come to the café and spread the Word, although maybe not all of you at 9am on the first morning!"